There are several benefits of asphalt sealing including; protection from sun damage caused by UV rays, reducing the rate of water permeation, fresh aesthetic update, easier to stripe, extending the life of your pavement. For these reasons, you should budget for and plan on regular asphalt sealing. 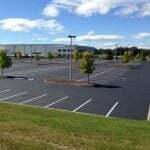 A newly laid asphalt parking lot should be sealed within the first year of application, and every 2-3 years after. Weather – Simply put, summer temperatures are ideal for asphalt paving. 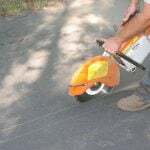 When asphalt sealing in the summer, you’re allowing for the sealer to cure effectively and naturally with the warmth of the sun. Overnight Temperatures – During the fall, spring, and winter, temperature fluctuations are extremely common, especially when going from day to night. However, in the summer, temperatures remain fairly consistent and stay well above 60 degrees through the night. This allows for proper curing of the asphalt sealer resulting in less complications caused by temperature variations. Longer Days – Summer days mean increased hours of sunlight. Increased hours of sunlight mean that exterior contractors can work later. Longer workdays allow for your parking lot asphalt sealing job to be completed in fewer days, which reduces the inconvenience of sealing on you and your customers. Fewer days of work will also typically mean cheaper final costs. Cost Effective – These longer days allow for paving companies to group and “fit in” multiple jobs in a day. This saves us trips and time, which directly results in cost savings for you, the customer! Additionally, once paving contractors approach our busiest season (more towards September), prices will typically increase and remain firm. 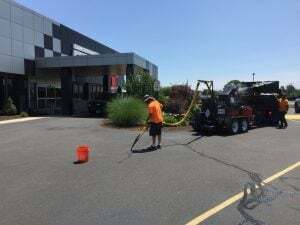 Drying Speed – Let’s face it, parking lot paving and sealcoating can be inconvenient for your customers, residents, and tenants – so the quicker it dries the better. Sealcoating generally dries quickly already, but this drying process is sped up even more during hot summer days. Sun Protection – Similar to putting sunscreen on your skin when in the hot summer sun, your asphalt sealer is a layer of protection for your pavement. Applying asphalt sealer in early summer helps to protect your pavement through summer, especially as temperatures continue to climb in late July through August. Some common signs of asphalt suffering from sun damage are; surface breaking and decaying, cracking, warping, and melting or disfigurement. 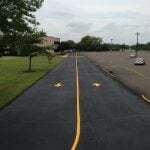 In preparation for parking lot asphalt sealing, you will want to make sure that your lot is cleaned, inspected, and that the problem areas are properly identified by your paving contractor. Sealcoating works best when in conjunction with crack filling, so for ideal protection, we will want to make sure that all cracks are filled first, before sealing. 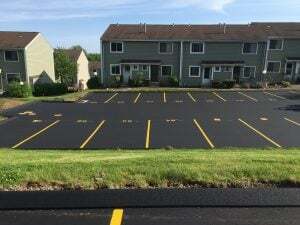 After your parking lot sealer has been applied and is dried, we can more easily and effectively restripe your lot! With a new coat of sealer, and freshly painted lines, your parking lot will look renewed and visually appealing, increasing your property’s curb appeal. 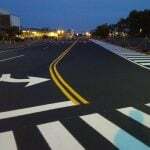 Additionally, it will also be safer in terms of traffic flow, proper pavement markings, and protection of your asphalt investment. Now is a great time to have your parking lot sealed! Contact EastCoat Pavement today for your free consultation and reap all of the benefits of summer asphalt sealing!